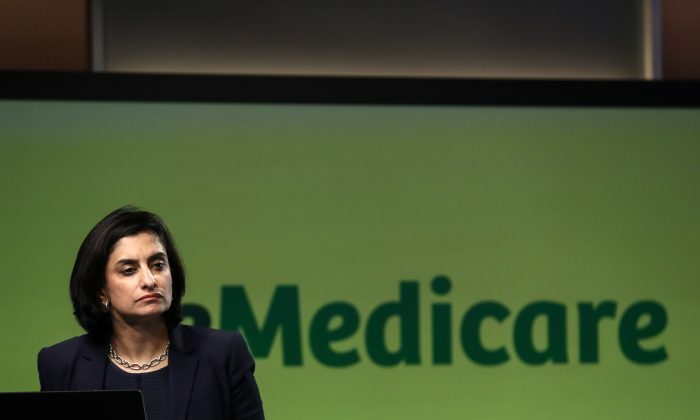 WASHINGTON—”Medicare for All” might sound too good to be true, which means it probably is, says Seema Verma, the administrator for the Centers for Medicare & Medicaid Services (CMS). Health care as a “right” and “Medicare for All” became memes during the 2016 presidential campaign of Bernie Sanders’s (I-Vt.), and have become increasingly mainstream among left-leaning politicians. Medicare for All, also known as single-payer health care, effectively takes away employer-sponsored health care plans and the private health insurance industry, and replaces it with a single, government-run health insurer. Four days before the midterms, Verma’s post challenges arguments made by Sanders and other Democrats that a single-payer health care system will lower costs, increase access to care, and make health care more affordable for those it was meant to serve—America’s elderly and those with disabilities. Countering Sanders’s claims that single-payer health care will reduce overhead and administrative costs, Verma says the only reason Medicare appears to be more cost-effective than a private insurance company is that Medicare doesn’t have the resources to provide the oversight that the program needs. Less than one-fifth of a percent of Medicare’s 1 billion annual claims are reviewed for fraud, she says. “Those advocating ‘Medicare for All,’ due to lower administrative costs, need to understand those costs are lower principally (or in part) because of an under-funded, inadequate system of review to detect fraud and abuse,” she wrote. As for its cost to taxpayers, Sanders estimates Medicare for All would cost an additional $1.38 trillion a year, which is significantly lower than other estimates by economists. According to Congressional Budget Office, total outlays for Medicare in 2018 are projected to be $707 billion. Kenneth Thorpe, a health policy professor at Emory University and a health policy adviser in the Clinton administration, estimated in a 2016 study that the cost of Medicare for all would be $2.5 trillion a year. A study by George Mason University’s Mercatus Center put the cost increase at $32.6 trillion for the first 10 years, a breakdown of $3.26 trillion more per year. Sanders’s solution, according to his 2016 plan, is to increase taxes on employers and families, close tax loopholes, and increase taxes on things like inheritance. What both Sanders and Verma do agree on, however, is that drug prices are too high, especially compared to other countries. Sanders has argued that if the government were the sole payer for health care, it would have almost infinite leverage when negotiating drug prices with manufacturers, and thus be able to drive down prices. Under the current system, Verma says that wouldn’t be the case because the program is a “price taker” for drugs when it comes to Medicare Part B, which mainly covers drugs that are administered in a doctors office. Last month, CMS proposed a rule that would peg U.S. drug prices to an international index of mostly developed nations, to bring down U.S. drug prices. CMS also proposed paying a flat add-on fee to health care providers instead of a percentage, thus removing the incentive for doctors to prescribe more expensive medications. Taking aim at the claim that Medicare will still provide quality care for the 60 million people in the program, Verma argues that the reason the program is able to provide the level of care it does is that the 170 million people with private insurance subsidize the program. Again citing the Mercatus study, which estimates doctors would receive 40 percent less under Medicare for All, she predicts that it would create a shortage in doctors and longer wait times for basic services.